This chapter discusses the ways in which moral psychology can inform information ethics. A “Four Component Model” of moral behavior is described involving the synergistic influences of key factors including sensitivity, judgment, motivation, and action. Two technology-mediated domains, electronic communications and digital property, are then explored to illustrate how technology can impact each of the four components believed to underlie moral behavior. It is argued that technology can create a kind of “psychological distance” between those who use technology for communication or those who acquire and use digital property (e.g., software or music) and those who may be affected by such uses (e.g., e-mail recipients or digital property owners). This “distance” potentially impacts all four components of moral behavior in such a way that the usual social or moral constraints operative under normal (non-technology-mediated) circumstances (e.g., face-to-face communication) may be reduced, thereby facilitating the occurrence of unethical activities like piracy, hacking, or flaming. Recognition of the potential deleterious impact of technology on each of the four components leads to a better understanding of how specific educational interventions can be devised to strengthen moral sensitivity, judgment, motivation, and action within the context of our increasingly digital world. We ignore ethics and computing at our peril! Unethical behavior is pervasive and timeless, as is the question of why people do bad things. What makes some people behave morally or ethically and others not? Psychologists interested in moral development have attempted to answer such questions by examining the psychological components of morality, the elements that work in concert to bring about moral behavior (Rest, 1983). Emerging from this work is a model of moral behavior that identifies the joint action of four psychological processes: sensitivity, judgment, motivation, and action (Narvaez & Rest, 1995). Certainly, the “information age” has been accompanied by its share of technology-related ethical issues and challenges. Interestingly, many (if not most) of these challenges are not fundamentally new (Barger, 2001). Although there may well be exceptions, information technology appears to have created new and different ways to engage in the same kinds of unethical behaviors seen throughout history, from stealing property to invading personal privacy (Johnson, 2001). Because these issues have been studied and analyzed for years in other contexts, it is all the more important for Information Science (IS) researchers and practitioners to be well acquainted with general principles of moral and ethical development. Indeed, it is now well-attested that our perceptions of the moral landscape are influenced by developmental and social-cognitive factors (Lapsley & Narvaez, 2004). In order to plan educational interventions that help technology users develop appropriate ethical attitudes and behaviors with respect to their use of information technology, educators can take advantage of a wealth of knowledge about moral development from the field of moral psychology. The purpose of this chapter is to acquaint those working in the field of Information Science with a psychological perspective on moral or ethical behavior. 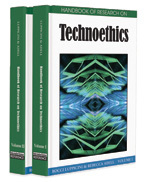 In this chapter we examine key psychological processes that are critical for moral behavior, discuss the function of these processes in the domain of technology, and suggest strategies to enhance education related to information ethics. At the outset, it is important to draw attention to our use of certain terms. While we make no substantive distinction between the terms “moral” and “ethical,” there is an important difference between what may be considered “moral” and what is “legal,” or conversely between what is “immoral” and what is “illegal.” To be “legal” is to conform one’s behavior to the laws established by the societies in which we live. Morality, on the other hand, is a matter of conformity to “divine law” or codes of conduct derived from principles of right and wrong that transcend societal strictures. There is no automatic correspondence between that which is “legal” and that which is “moral,” or vice versa. That is, depending on the society, what many would consider immoral practices may be considered legal (e.g., prostitution in Nevada), while some illegal practices (e.g., harboring Jewish fugitives in Nazi Germany during World War II) may be quite moral. The Four Component Model (Narvaez & Rest, 1995; Rest, 1983) represents the internal “processes” necessary for a moral act to ensue: moral sensitivity, moral judgment, moral motivation, and moral action. These components are not personality traits or virtues; rather, they are major units of analysis used to trace how a person responds in a particular social situation. The model depicts an “ensemble of processes,” not a single, unitary one. Therefore, the operation of a single component does not predict moral behavior. Instead, behaving morally depends upon each process and the execution of the entire ensemble. Each process involves cognitive, affective, and behavioral aspects that function together in fostering the completion of a moral action.